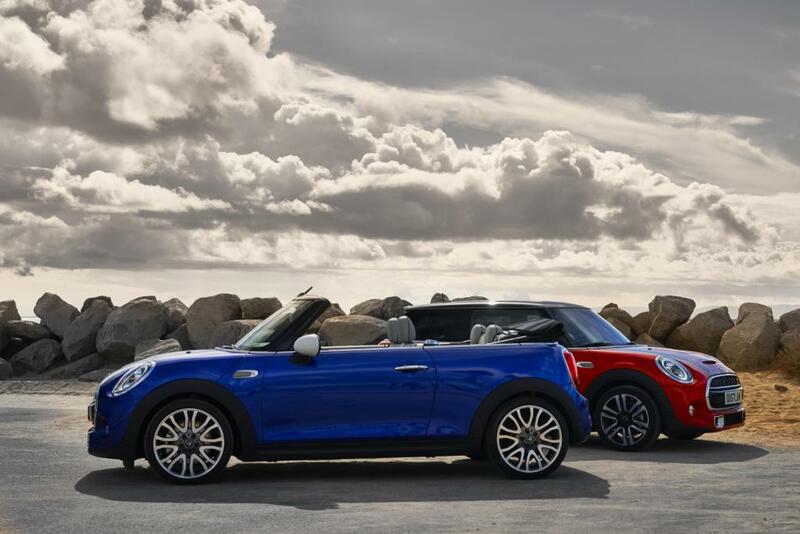 New tech, new connectivity and a new MINI range for 2018: the new MINI 3-Door Hatch, the new MINI 5-Door Hatch, the new MINI Convertible. 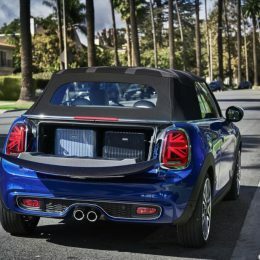 New technology, cutting-edge connectivity, standard-fit front and rear LED lights across the range and an advanced dual-clutch automatic gearbox are just some of the features in the new 2018 MINI 3-Door Hatch, MINI 5-Door Hatch and MINI Convertible, which will launch at MINI retailers across the UK on 17 March 2018. The changes are focused on driver appeal and core new technologies, including MINI Connected Concierge services, wireless smartphone charging and first-in-class options such as new anti-dazzle adaptive headlights with Matrix high beam. 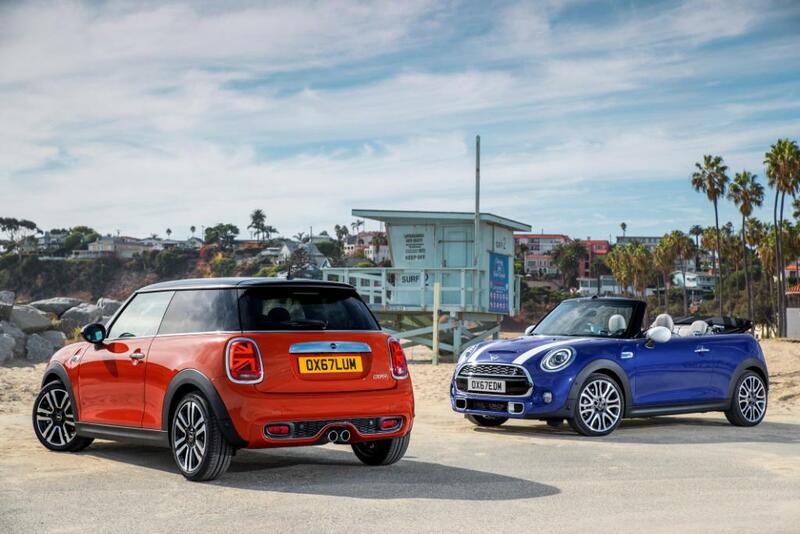 MINI 3-Door Hatch, MINI 5-Door Hatch and MINI Convertible: overview of new features. New design standard-fit front and rear LED lights for the UK market. First-in-class – new optional adaptive headlights with Matrix high beam. Unique individualisation with MINI Yours 3D printed parts. 6.5-inch colour infotainment screen, USB and Bluetooth connectivity and multifunction steering wheel fitted as standard. New touchscreen MINI Navigation with Apple CarPlay and wireless smartphone charging. New MINI Connected Services with Real Time Traffic Information (RTTI), Online Search, Natural Language Understanding and Concierge Service. New MINI logo, body finishes, Piano Black exterior and alloy wheel designs. Extended range of leather trim, new interior backlit surfaces and colour lines. MINI logo projection from the exterior mirror on the driver’s side. New 7-speed Steptronic transmission with double clutch and electronic shift selector. Further developed engines and increased capacity and torque for MINI One. Bright and dazzle-free: Font and rear LED lights now standard. First-in-class adaptive LED headlights with Matrix high beam optionally available. 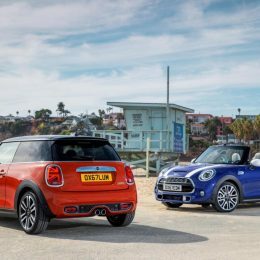 The exterior character of the new MINI range has been refreshed with the introduction of a new front and rear LED light design, enhancing the on-road presence of the new MINI 3-Door Hatch, MINI 5-Door Hatch and MINI Convertible. 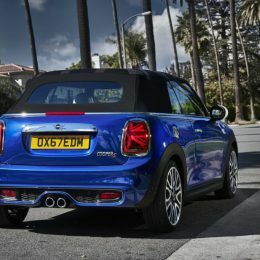 All versions of MINI Hatch and MINI Convertible sold in the UK get the same front and rear LED lamps as standard, for the first time in this segment. The LED lamps have a stronger, brighter beam pattern than the outgoing halogen headlamps, while the daytime running lamps and indicators are also LED-based, forming a new ring design around the headlights themselves. The three-dimensional LED rear lamps cleverly incorporate horizontal turn signals and vertical brake lamps within a distinctive new light cluster. The LED lamps benefit from greater long-distance visibility, without dazzling other road users. First-in-class new ‘Matrix’ adaptive LED headlamps will be offered as an option on the new MINI Hatch and Convertible range, which automatically adjusts brightness using a matrix of different light elements to cater for specific road conditions. For example, the lamps can offer additional illumination to the side of the road in both urban and rural areas, while the high beam lights have greater intensity at motorway speeds, without dazzling oncoming drivers. The adaptive LEDs also feature an automatic selective dip function when on high beam, which automatically extinguishes the parts of the lamp which may dazzle other drivers, while at the same time offering optimal illumination. Each lamp is divided into four horizontally arranged segments, which are activated and deactivated independently of one another at speeds of over 45mph. The high beam segments effectively ‘read’ the road, and as soon as the MINI front camera registers an oncoming vehicle or a vehicle driving ahead, the space that vehicle occupies is only illuminated at low beam brightness. This is done by deactivation of the Matrix segments that cover the space in question, while the remaining areas of the road continue to be illuminated at high beam brightness. New MINI logo: reduced to the essentials. 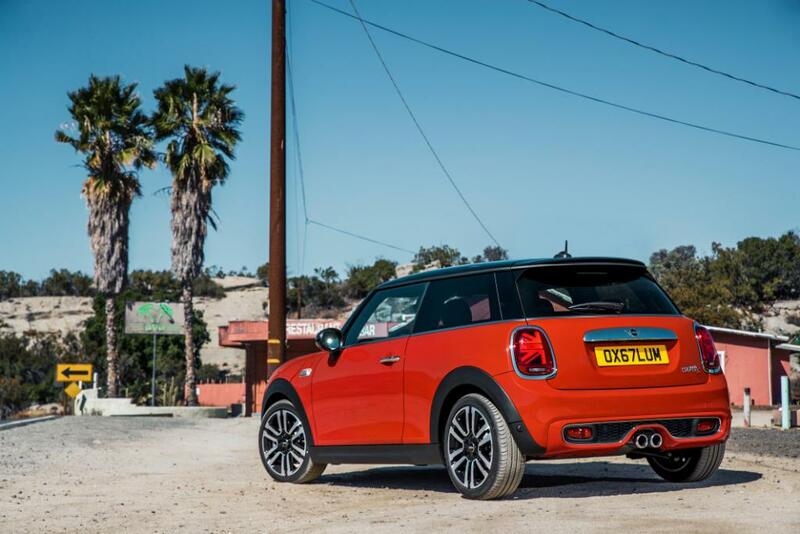 The 2018 MINI range will also see the debut of an all-new MINI logo on the vehicle. The new badge has a flat two-dimensional design, reflecting MINI’s new brand identity with its focus on the essentials – namely key values such as driving fun, distinctive design, premium quality and emotional appeal. The new logo appears on the bonnet, tailgate, steering wheel, instrument display and central locking remote control on all models. Three new colours, including premiere for Piano Black Exterior. The range of body finishes available for the new MINI range includes three brand new colours, namely Emerald Grey metallic, Starlight Blue metallic and Solaris Orange metallic. In addition, exterior options now include an additional means of customising the exterior design – a popular practice among MINI customers. With the Piano Black Exterior pack, the surrounds of the headlights, rear lights and radiator grille are finished in high-gloss black instead of chrome. The choice of alloy wheels has been expanded, too. 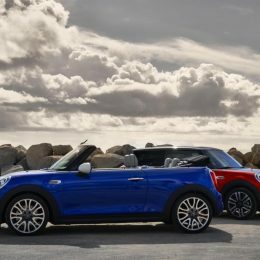 17-inch ‘Roulette’ and ‘Propeller’ designs are now available for all body variants of the new MINI Hatch and Convertible, along with a new ‘Rail’ two-tone wheel. New leather trims, interior surfaces and colour lines. A broad selection of seat surfaces, interior surfaces and colour lines add a touch of individual style to the interior of the new MINI range. These include Chester leather trim in Malt Brown and a colour line now also available in Malt Brown. 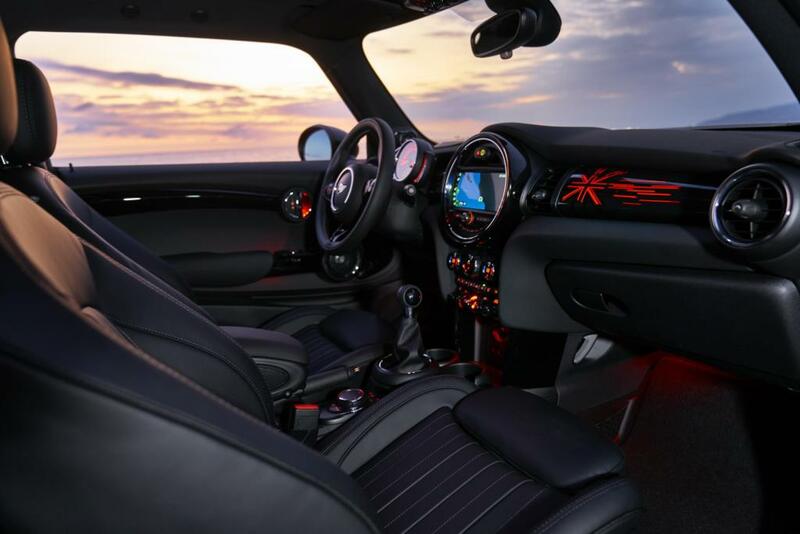 A brand new option for 2018, MINI Yours Interior in Piano Black, provides MINI Hatch and Convertible customers with the option of a distinctive backlit decorative strip for the passenger side of the instrument panel. 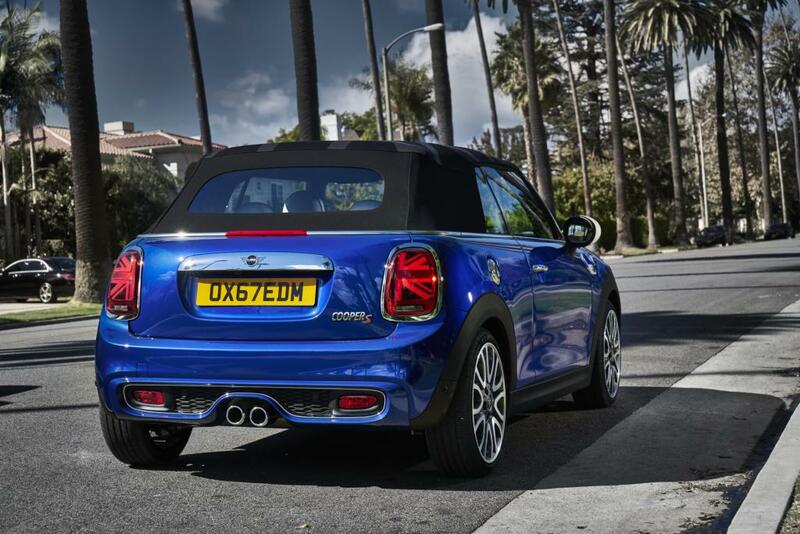 Stylised in a Union Jack motif, the colour of the background lighting for the decorative strip matches that of the vehicle’s ambient lighting selected by the driver as part of the MINI Excitement Package. This option also enhances other area of the cabin, adding a distinctive high gloss black appearance to the door inners and centre console. Maximum individualisation: MINI Yours Customised. 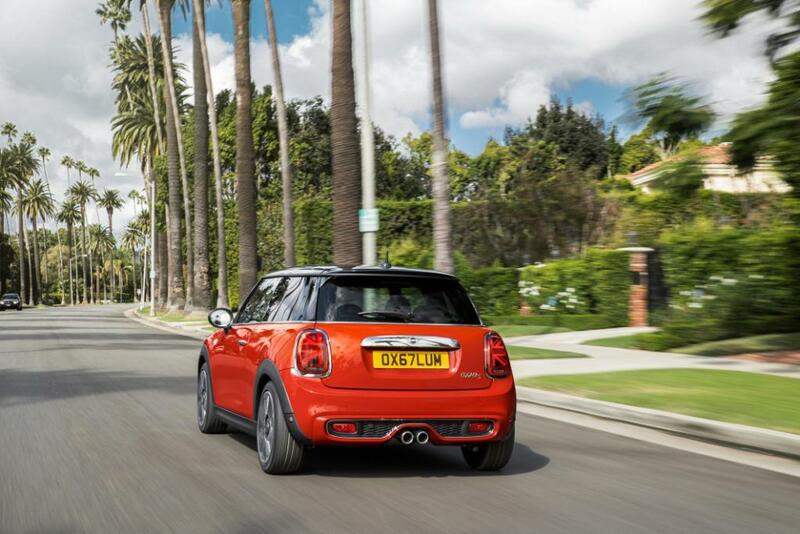 The MINI Yours Customised program raises brand individualisation to a whole new level. It includes new products whose design can be created by customers themselves, which are then produced precisely according to their individual specifications. The MINI Yours Customised range includes side scuttles, decorative strips for the interior on the passenger side, LED door sill finishers and LED door projectors. MINI Yours Customised products can be selected, designed and ordered through a specially created online shop launching later in 2018. Here customers can choose between various colours, patterns, surface structures and icons, as well as contributing their own texts and adding a touch of personal style to the design. This creative interaction between manufacturer and customer enables MINI drivers to turn their vehicle into a unique expression of their own personality. The individualised products are manufactured using innovative production techniques, including 3D printing and laser engraving. Drive: increased driving fun and reduced weight. Revisions to engines and powertrain have been made to further enhance driving fun. 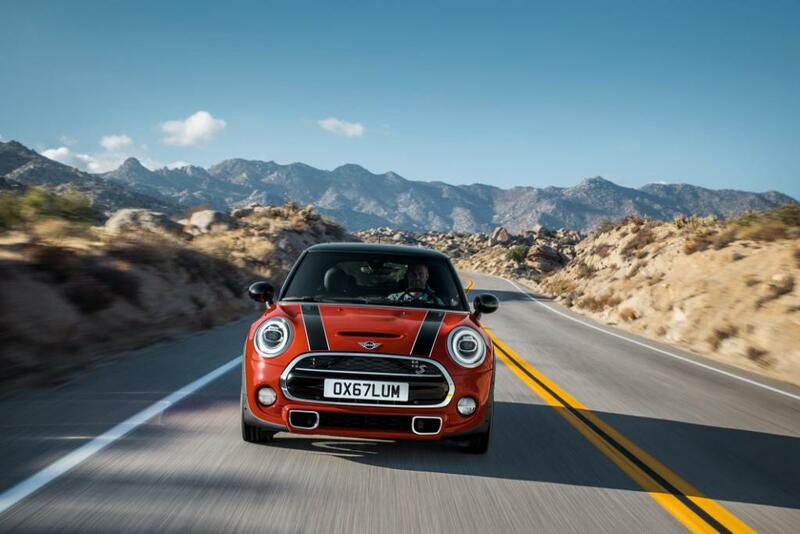 Development has been applied across the board, including the basic engine, MINI TwinPower Turbo Technology, engine electronics, oil supply, intake air ducting, the cooling system and the exhaust system. One very clever feature of the new MINI engines is the use of carbon-fibre reinforced plastic (CFRP) on the engine covers, which not only contributes to further weight reduction, but also takes advantage of using recycled material generated during the production of BMW’s ‘i’ range of electric vehicles. The 3-cylinder petrol engine in the MINI One has seen an increase in capacity to 1.5 litres, increasing maximum torque by 10 Nm, taking it to 190 Nm. New: 7-speed Steptronic transmission with double clutch with electronic selector lever. 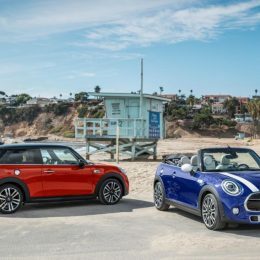 All new MINIs come with a precise six-speed manual gearbox as standard, but now 3-Door Hatch, 5-Door Hatch and Convertible models are now also available with a 7-speed Steptronic transmission with double clutch as an option. 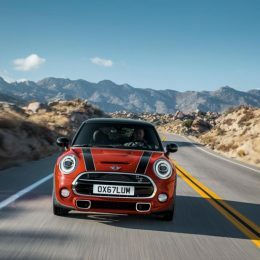 The transmission is offered on MINI One, MINI Cooper, MINI Cooper S and MINI Cooper D engine variants, and is characterised by very fast gearshifts, enabling sporty acceleration and an impressive spread of torque. The transmission comes with an all-new electronic selector lever, while on the MINI Cooper S the automatic option includes shift paddles at the steering wheel for a level of manual intervention. All Steptronic transmissions allow the car to coast in MID and GREEN mode and incorporate the latest generation of auto start/stop functions. Using the satellite navigation data and the car’s inbuilt camera systems, the stop/start can be intelligently controlled to identify situations in which it is better not to switch off the engine: for example when stopping briefly before making a turn or entering a roundabout, or if the traffic ahead has started moving again. 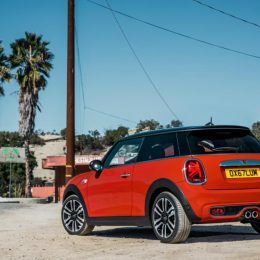 MINI One 3-Door Hatch: 75 kW/102 hp, 0 – 62 mph in 10.1 seconds (10.2 seconds), top speed: 121 mph (121 mph), fuel consumption: 57.6 mpg combined cycle (58.9 mpg combined cycle)*, CO2 emissions: 115 – 111 g/km (114 – 109 g/km)*. 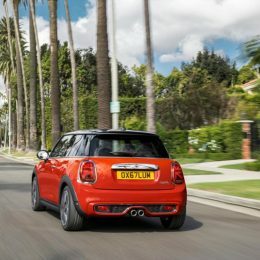 MINI Cooper 3-Door Hatch: 100 kW/136 hp, 0 – 62 mph in 7.9 seconds (7.8 seconds), top speed: 130 mph (130 mph), fuel consumption: 56.5 mpg combined cycle (58.9 mpg combined cycle)*, CO2 emissions: 118 – 114 g/km (114 – 109 g/km)*. 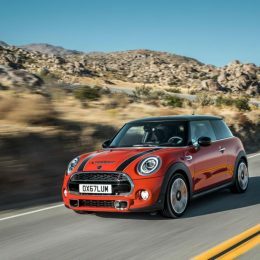 MINI Cooper S 3-Door Hatch: 141 kW/192 hp, 0 – 62 mph in 6.8 seconds (6.7 seconds), top speed: 146 mph (146 mph), fuel consumption: 47.1 mpg combined cycle (54.3 mpg combined cycle)*, CO2 emissions: 139 – 138 g/km (120 – 119 g/km)*. MINI John Cooper Works 3-Door Hatch: 170 kW/231 hp, 0 – 62 mph in 6.3 seconds (6.1 seconds), top speed: 153 mph (153 mph), fuel consumption: 42.8 mpg combined cycle (49.6 mpg combined cycle)*, CO2 emissions: 150 g/km (130 g/km)*. MINI Cooper D 3-Door Hatch: 85 kW/116 hp, 0 – 62 mph in 9.2 seconds (9.3 seconds), top speed: 127 mph (127 mph), fuel consumption: 3.9 – 3.9 litres/100 km (3.8 – 3.8 litres/100 km)*, CO2 emissions: 103 – 102 g/km (100 – 99 g/km)*. 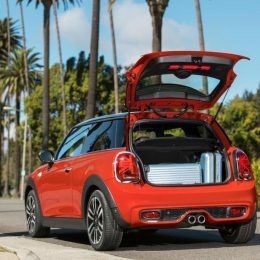 MINI One 5-Door Hatch: 75 kW/102 hp, 0 – 62 mph in 10.3 seconds (10.5 seconds), top speed: 119 mph (119 mph), fuel consumption: 57.6 mpg combined cycle (58.9 mpg combined cycle)*, CO2 emissions: 116 – 112 g/km (115 – 110 g/km)*. 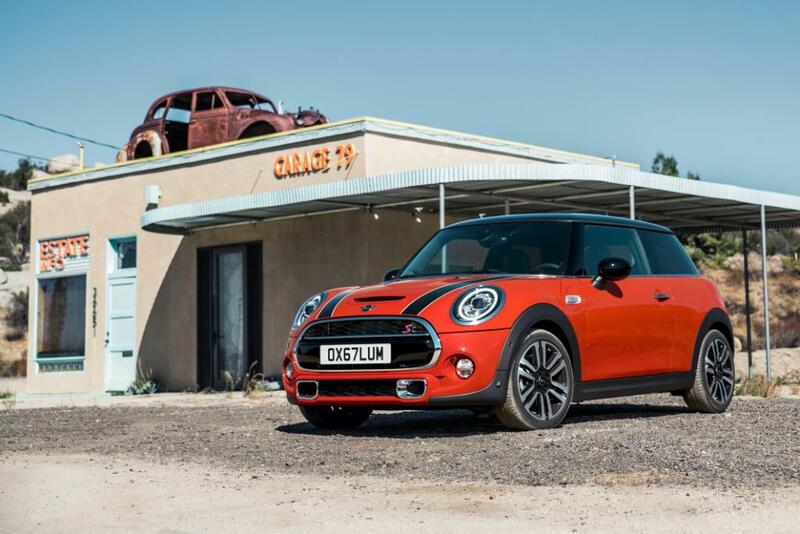 MINI Cooper 5-Door Hatch: 100 kW/136 hp, 0 – 62 mph in 8.2 seconds (8.1 seconds), top speed: 129 mph (129 mph), fuel consumption: 55.4 mpg combined cycle (58.9 mpg combined cycle)*, CO2 emissions: 120 – 116 g/km (115 – 110 g/km)*. 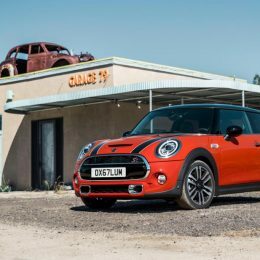 MINI Cooper S 5-Door Hatch: 141 kW/192 hp, 0 – 62 mph in 6.9 seconds (6.8 seconds), top speed: 146 mpg (146 mpg), fuel consumption: 45.6 mpg combined cycle (52.3 mpg combined cycle)*, CO2 emissions: 143 – 141 g/km (124 – 123 g/km)*. MINI Cooper D 5-Door Hatch: 85 kW/116 hp, 0 – 62 mph in 9.4 seconds (9.6 seconds), top speed: 126 mph (126 mph), fuel consumption: 4.0 – 3.9 litres/100 km (4.0 – 3.9 litres/100 km)*, CO2 emissions: 104 – 103 g/km (104 – 103 g/km)*. 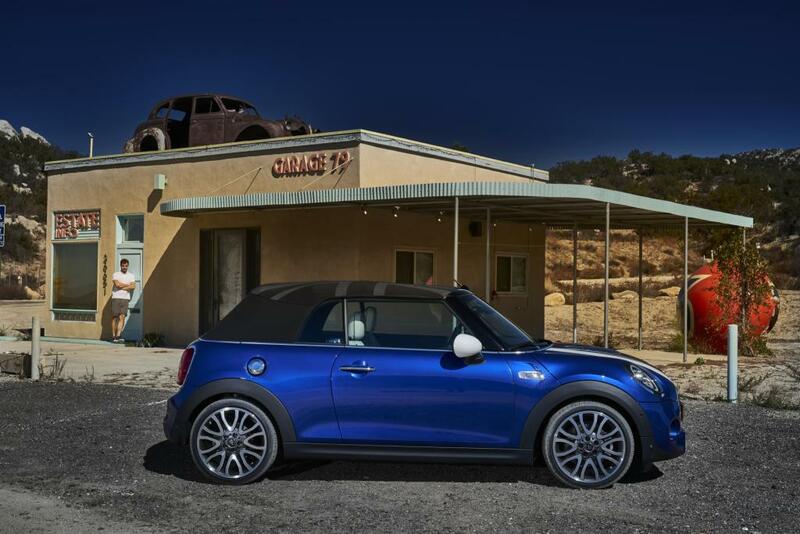 MINI Cooper Convertible: 100 kW/136 hp, 0 – 62 mph in 8.8 seconds (8.7 seconds), top speed: 129 mph (128 mph), fuel consumption: 54.3 mpg combined cycle (54.3 mpg combined cycle)*, CO2 emissions: 123 – 119 g/km (123 – 118 g/km)*. 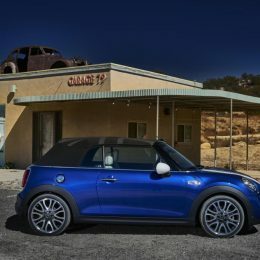 MINI Cooper S Convertible: 141 kW/192 hp, 0 – 62 mph in 7.2 seconds (7.1 seconds), top speed: 143 mph (143 mph), fuel consumption: 44.8 mpg combined cycle (57.4 mpg combined cycle)*, CO2 emissions: 123 – 119 g/km (123 – 118 g/km)*. MINI John Cooper Works Convertible: 170 kW/231 hp, 0 – 62 mph in 6.6 seconds (6.5 seconds), top speed: 150 mph (149 mph), fuel consumption: 42.2 mpg combined cycle (47.9 mpg combined cycle)*, CO2 emissions: 152 g/km (136 g/km)*. New steering wheel with multifunction buttons and radio with 6.5-inch colour screen as standard. The newly designed three-spoke steering wheel in the MINI range now features multifunction buttons. On the left-hand control panel it is possible to activate the Speed Limit Device to set a maximum speed, while the audio and communication controls are on the right-hand side. 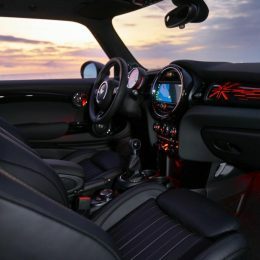 A sports leather steering wheel, a MINI Yours sports leather steering wheel and a John Cooper Works leather steering wheel are all available as options. The standard trim also includes an audio system with 6.5-inch colour screen in the central instrument panel and mobile phone integration via Bluetooth. New options: Refreshed Pepper and Chili packs now include rear PDC and MINI Logo projection as standard. 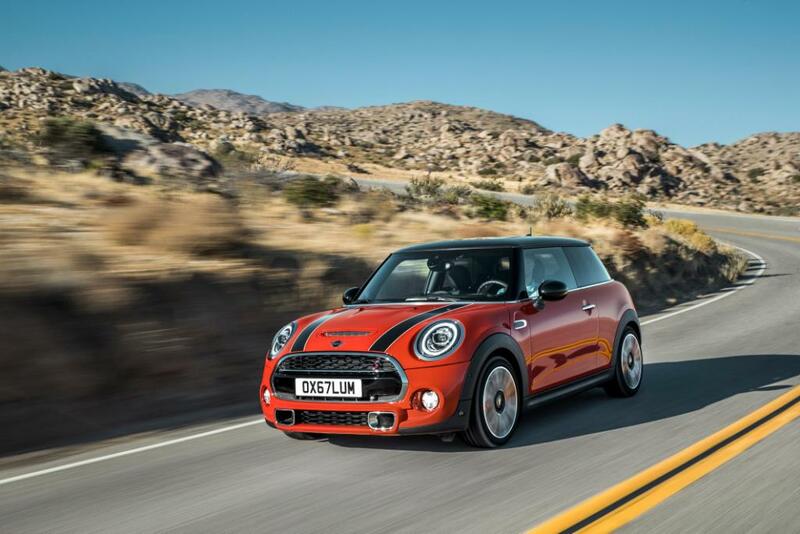 For 2018, MINI has introduced new options and enhanced the equipment offered in the popular Pepper and Chili packs. Pepper Pack adds extra content including 15-inch light alloy wheels, MINI Excitement Pack, leather steering wheel, rain sensor with automatic headlight activation and automatic air conditioning. A new addition to the Pepper Pack in 2018 is rear park distance control (PDC) ensuring that the MINI vehicles are easier than ever to park in and around town. Chili Pack builds on the contents of the Pepper Pack, adding extras features including 17-inch light alloy wheels, cloth and leather upholstery, a sport steering wheel and a sport button to further enhance the driving experience. The MINI Excitement Package, which is included in the Pepper and Chili packs for UK customers, now includes MINI logo projection on the driver’s side. When the vehicle door is opened and closed, the new MINI logo is projected onto the ground in front of the door from a light source in the exterior mirror and can be seen there for 20 seconds, or permanently if the door is left open. Infotainment and Navigation: 6.5-inch full colour display as standard and debut of new Navigation Plus Pack with wireless charging. As standard, all vehicles will have a 6.5-inch full colour display and standard rotary controller. Customers can choose to upgrade this screen to include optional MINI Navigation with a touchscreen display and Apple CarPlay functionality. MINI has simplified the range of additional infotainment packs for UK customers in 2018, with one new infotainment package now offered. 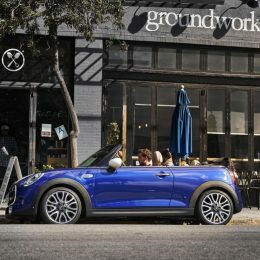 The new Navigation Plus package contains a raft of innovative optional equipment, including MINI’s new 8.8-inch touchscreen display, wireless charging, new MINI Connected Services including Real Time Traffic Information, new Natural Language Understanding functionality, MINI Concierge Service, online services and Apple CarPlay. The new wireless charging feature, available as an option or as part of the Navigation Plus package, is facilitated via a storage compartment in the centre armrest which will automatically and wirelessly charge mobile phones which support this capability. This option also includes a second USB socket in the front section of the centre console. MINI Connected: a range of digital services that is unique within the segment. 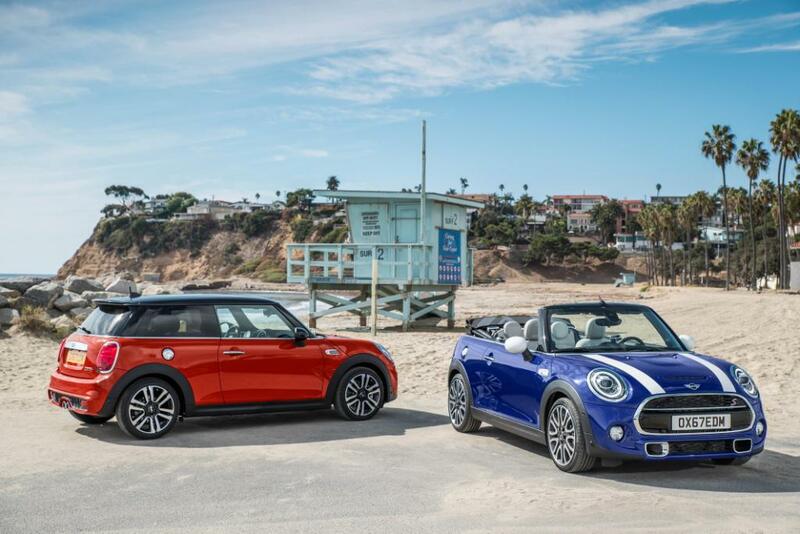 MINI offers class-leading premium digital services, many of which are unique in the small car segment. New features in the leading MINI Connected package include Real Time Traffic Information and automatic navigation map update via mobile phone connection, a personal Concierge Service and a vehicle internet portal MINI Online, with news, weather and fuel price updates. Another option is Apple CarPlay compatibility. MINI Connected enables MINI drivers to integrate their vehicle and travel plans seamlessly into their day-to-day digital routine. 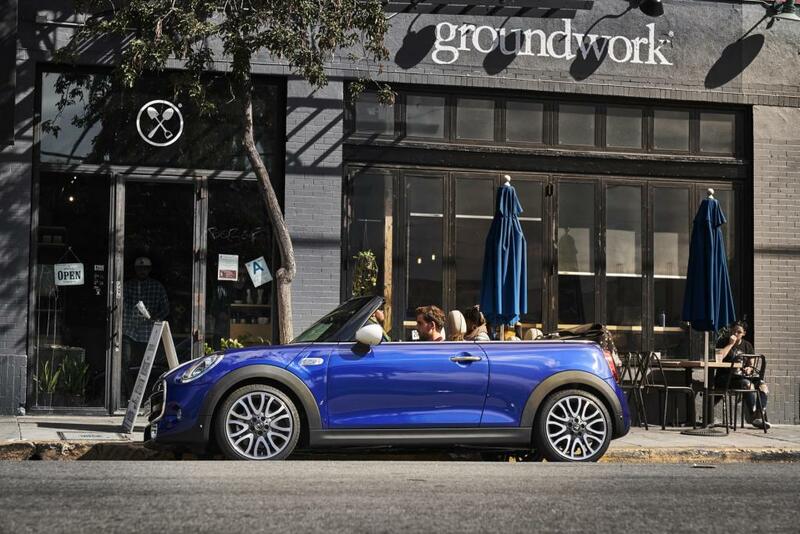 Meanwhile, the MINI Connected App provides connectivity with digital touchpoints such as a smartphone or smart watch. For example, MINI Connected can draw on calendar entries and contact data entered in a smartphone to plan routes and determine the ideal time to set off based on real time traffic data. The Send to Car function enables planned routes to be sent to the MINI navigation system, while Remote Services allow the driver not just to display vehicle location, fuel level and other vehicle status details on their smartphone, but also activate the headlight flasher, horn, ventilation and door lock/unlock function. 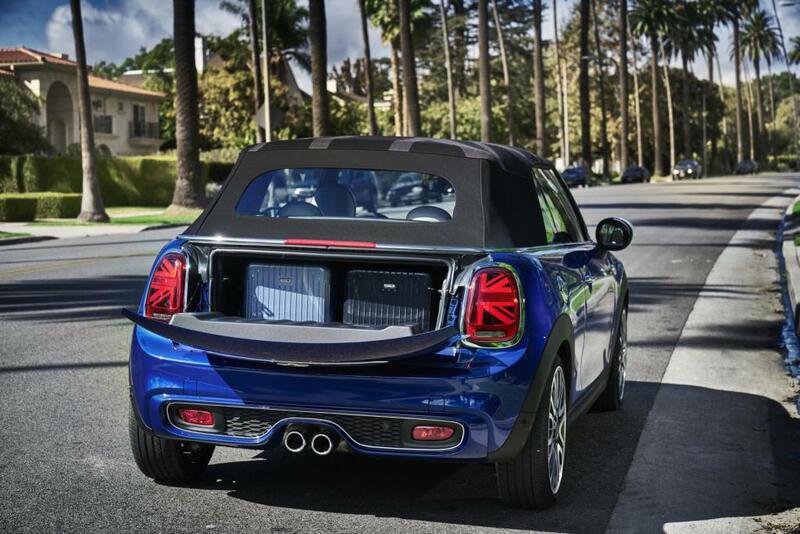 Intelligent networking is standard across the MINI range, via a 4G SIM card integrated into the vehicle. This enables the use of MINI Teleservices and the Intelligent Emergency Call with automatic detection of vehicle location and accident severity. 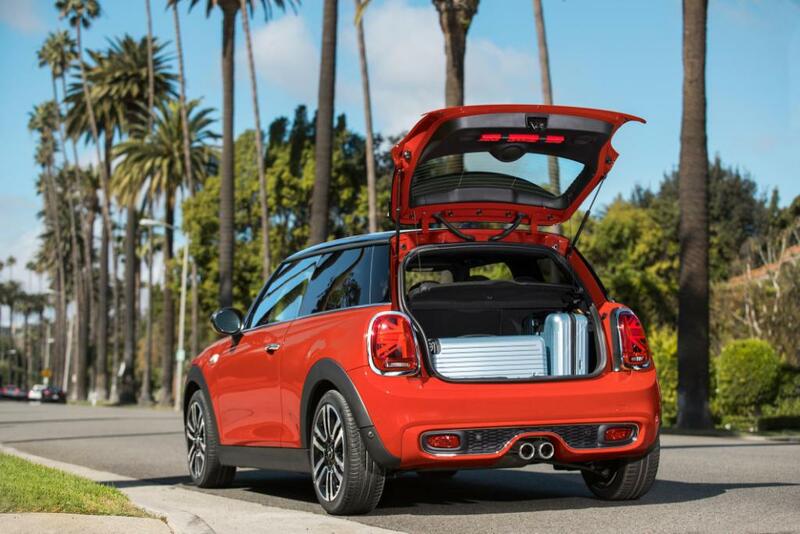 Another new 2018 option for Hatch and Convertible models is MINI Find Mate. This option consist of tags with a Bluetooth tracking function that can be attached to frequently used objects and travel items such as bags, cases, key rings and rucksacks. Their position can not only be displayed on the car’s on-board computer but also in your MINI Connected App on a smartphone, preventing personal items getting lost or left behind.